Add traditional elegance to a space with this charming lamp set of bronze table lamps. Decorate a room with these two matching table lamps. The set of 2 lamps has been inspired by traditional designs, and features handsome wood-tone finish bases. Decorative openwork leaf accents on each lamp come in a bronze finish. Each lamp is topped with a creme shade. Look, & elegant versatility it will give to the space! Love the looks. Prefer they weren’t resin, but will give them a try. They should match furnishings in room. Wooden carved look. Very unique. Best value. Searched everywhere and saw this set. Most unusual and what I was looking for! I chose these lamps because of the color and unique base shape. Looks wonderful and love the design. Will go great with my furniture! They were slender & tall, perfect for my tables. Hope they don't take long to arrive like Rooms To Go (3 weeks) terrible. The style grabbed my attention and I like the idea of the rectangular shade to allow the lamps to be closer to the wall. I hope the quality is good, but the free return policy is reassuring if I want to try some other lamps if these don't work out. It compliments my bedroom furniture. We have a lot of antique furniture in our house, and these lamps are beautiful. Fit our decor and I love the shape of the shades. Looks like quality, elegant lamps at a great price. Height what I wanted. Needed new lamps for my bedroom and really like the look of these lamps! They look really elegant! I loved the look of the wood and the bronze finish. This pair of lamps are gorgeous, i have a perfect pair for a perfect living room,I am a hurricane harvey victim .. The color of the wood , match my tables and furniture. Color and design matched my furniture. I liked the height of the tabel & the color. I like the prices of the lamp sets. They are beautiful and will fit my decor perfectly! I have one of these and the other broke. Can I purchase just one? BEST ANSWER: Hi - I am sorry, these are only priced as a set of 2. Are the shades round and what is their color? BEST ANSWER: Hi - they are rectangular crème colored lamp shades (9" X 6") top X (14" X 10") bottom X 10 1/2" high. How long does it take to receive lamps after ordering? BEST ANSWER: The lamps usually ship within 3-7 business days. If I recall correctly, it was less than a week. It could not have been very long because of I have remembered that. I don't exactly remember but it was pretty fast. Maybe a couple of days. Is the total height of your lamps measured from bottom to the finial? BEST ANSWER: That's correct. The measurement listed is the overall height from the very bottom of the lamp to the top of the finial. The lamps measure 30 inches from bottom to top of finial. Yes. From bottom to finial. WHY CAN'T I USE A 3 WAY BULB? I SEW BY THE LIGHT OF MY LIVING ROOM LAMP. LOVE THE LOOK OF THESE LAMPS. BEST ANSWER: Unfortunately, this lamp does not offer a 3-way socket. If you wish to convert them to a 3-way you can. The sockets can be purchased at any local hardware store; however, any modifications or alterations to the lamp will void the warranty. These lamps are apparently designed with a simple on/off switch which doesn't allow for a 3-way bulb.You can buy a pair of Hue smart bulbs (or equivalent) and control the brightness and even color of the light thru your smartphone. Lamp switch needs to be 3-way as well as the bulb. These lamps or strictly on-off switched. The switch is only two way....on and off. A three way bulb will not work in this lamp. Hi - yes, you could use a 60 watt bulb with these lamps. You can use up to a maximum 100 watt standard bulb, so a 60 watt bulb will work just fine. No they are not cordless, they plug in to a standard outlet. Pretty inexpensive lamps, so not too bad for the money. It is faux wood and metal. The shade is adequate. Delivery was good - did have to wait a bit longer than normal things I order on line - but it was worth the wait. The lamps met all expectations! We again bought a product that was not in stock, so we had to wait for it to come from California. That has happened to us a number of times from the Lamps Plus store. All in all, we are happy with the purchase. I bought these lamps for our bedroom, they look great and the price was right. The paint is not very good I tried to cover a couple of scratches with a pen that is made for that purpose and it rubbed the paint off completely, so don't try to cover any scratches you find! Love these lamps. Very stylish and functional. My only complaint is they came unassembled in a box for easier shipping. You should have no problem putting these together but if you are mechanically challenged you may some difficulty. Just got my pair today. Even more beautiful up close and lit up. My room looks so elegant and 5 star ish after adding these lamps to my bedroom. Delivery was quickest and very nicely packed. Highly satisfied. Just Hope they stay the way they look today. beautiful, A gift 4 my granddaughter. beautiful designs on the lamps. I would tell a friend to buy these lamps. Received on time and so well packed. Great lamps for the money. Lamps were delivered on time and well packaged. This product was everything I expected it would be. Excellent service. Lamps were very well packed! Delivery was scheduled and lamps came on exact date. Lamps were packed carefully and were in perfect condition. The lamp is base is not what I expected. I expected a round base. The base is oblong and relatively thin. The picture shows the front view and gives the illusion of a larger fuller lamp. I LOVE THE LAMPS.THEY ARE MORE BEAUTIFUL IN PERSON. THE PRIZE IS GREAT TO.I HAVE THEM IN MY FAMILY ROOM EVERY PERSON THAT COMES OVER AND SEE THEM LOVE THE LOOKS OF THEM.I AM SO GLAD I ORDER THEM. Previously purchased four of these lamps. Two for my living room and two for my family room. Very stylish and happy with quality, so I purchased two more for my bedroom. Packed two for $99 ($50 apiece), you can't beat this price! Lovely lamps; shipped in a crush proof container. Easy assembly. 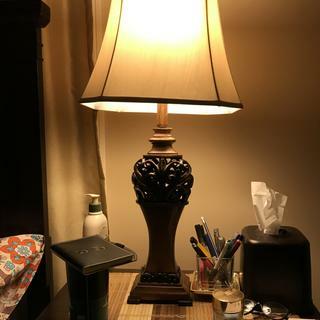 Love My lamps...I thought I loved them on the website, but after seeing them in person, I fell in love with them all over again..Looks like real wood..Works great on my marble top dark wood night stands. I bought 2 of these lamps to replace my old ones in my family room and they look really nice!! Thank you Lamps Plus. Also the lamps packaging was very secure and the arrival time was quick. Very nice lamps and good value at this price. Looks lovely and more expensive than they were. Very pleased with this purchase. These lamps more than met expectations. Don’t let the reasonable price fool you. They are well crafted and beautifully designed. Looks very nice, just lightweight. Shipping was fast. The lamps were packed very well. They were with defective at the design, I returned them a week ago and I didn’t get a refund jet, please make my refund so I can pay for another one! Hi Zoraida E., sorry to hear that your table lamps arrived with some defects in the design. Our customer service team has confirmed that your refund has already been processed. Please reach out to us if you would like assistance ordering your replacement lamps. Thank you. A lovely touch table lamp set each topped with a glass shade accented with a blue flower motif. This touch table lamp set features romanticswooping flower-etched glass panels on the shade. This ornate French candlestick table lamp boasts a beautiful metal lattice framed cylinder shade and scrolling details in an understated muted earthy hue.